When you look as cool, sleek and opulently glamorous looking as a Pioneer plasma TV, it really doesn't matter how big you are. In fact, we'd say that Pioneer's TVs look better as they get bigger. 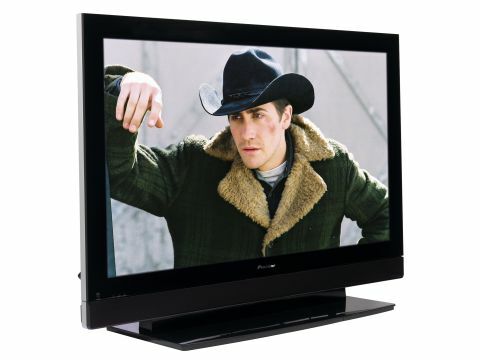 So that makes the brand's biggest ever TV, the 60in PDP-607XD, the Pioneer we most want to have in our living room. Especially as it's also a sparkling performer. Before telling you just why it's so much fun to watch, there's some nitty gritty to get through. Starting with connectivity there are two HDMIs, a component video jack, a PC VGA port, the usual Scart and S-video standards, a subwoofer line out, and a digital audio output for piping soundtracks received through the HDMIs to a receiver. The HDMIs are fairly unusual in that they can take the ultra-pure 1080p/24Hz hi-def video format offered by one or two high-end Blu-ray players. But the TV will not take the 1080p/50Hz or 60Hz modes used out by most upscaling DVD players. Other key features of the PDP-607XD include a built-in digital tuner; optional professional picture calibration by an Imaging Science Foundation (ISF) engineer to suit your living room conditions; various Pioneer screen build technologies including a deep waffle rib structure to reduce cross-pixel light/colour seepage, and a Crystal Emissive layer to boost contrast and brightness; and Pioneer's Pure Drive image processing engine. The net result of all this rocket science is some truly sensational image quality. The PDP-607XD eats our Revenge of the Sith test movie for dinner, revelling in the spectacular detailing visible in the forests of Wookie planet Kashyyyk. What's more, the screen's penchant for the finer things in hi-def isn't blighted by any significant grain or dot crawl side effects. Also immensely pleasing is how rich and colourful the PDP-607XD's pictures are. Brightness can be a problem on big plasma TVs, but here the rich colours of the volcanic action on Mustafa look terrifically vibrant. Just as important is the subtle naturalism with which the set shows skin tones during the low-lit scenes in the Galactic Senate. Pioneer's uncanny knack with showing motion is also retained by this new plasma giant. The countless space ships during the opening sequence all zip by with remarkable smoothness and not a trace of plasma's old motion noise problems, and unlike with LCD screens moving objects retain practically all their resolution. With some good, deep, well detailed black levels underpinning all the strengths we've alluded to so far, there really isn't anything serious negative to say about the PDP-607XD's hi-def pictures. What's more, if you cough up the extra £250 required for the PDP-607XD's optional speakers (it ships without speakers included), you'll find these pristine images joined by near hi-fi stereo audio prowess. Outstanding. The only time the PDP-607XD struggles is with standard-def sources, as a slight green undertone creeps into the colour palette, and there's noticeably more video noise. But you'd expect some problems pushing standard-def to 60in, and in any case, anyone buying a screen this expensive (£5,500 is a lot for 10in more picture than you get from Panasonic's £1,650 50PX70), and large will surely be feeding it as heavy an hi-def diet as possible.